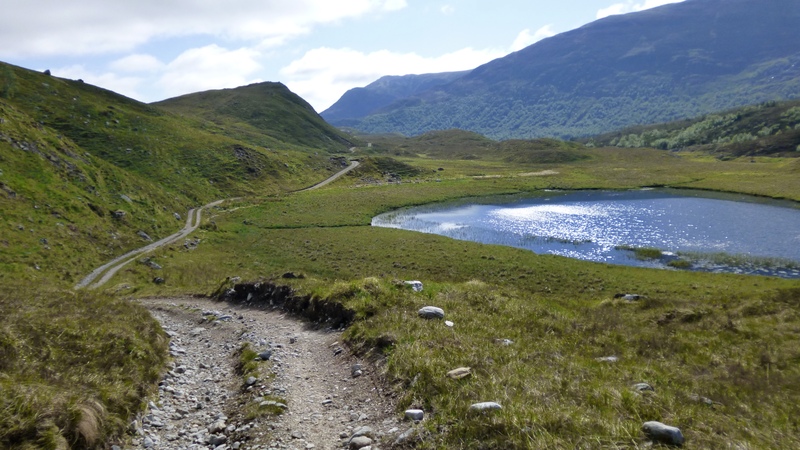 It’s 100 miles back to Tyndrum, and apart from the passage out of Glen Licht to Glen Affric, it was comparatively straight forward. I’m moving again quickly, taking breakfast on the road. 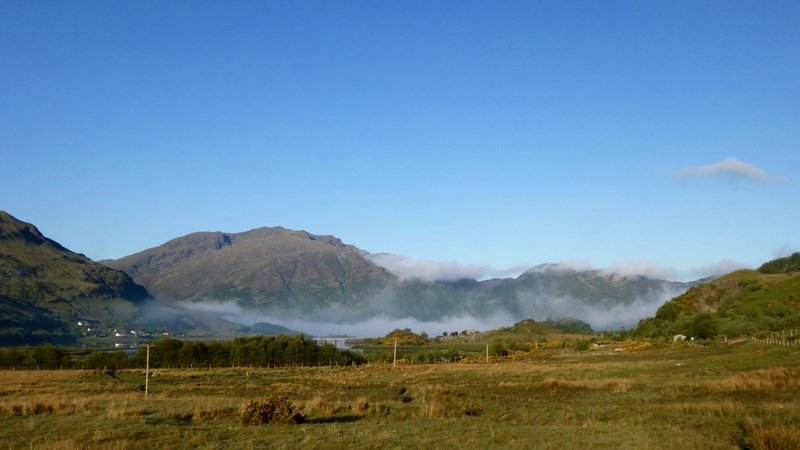 By Morvich, the sun had appeared over the hill and the sea mist at the head of Loch Duich was now lifting. I miss the turn for Glen Licht at the activity centre by 50 yards, and on turning round see Bryan Singleton riding towards me. He’d spent the night in Dornie public toilets, which is apparently more salubrious than it sounds. Alan Goldsmith was there too, but he was away earlier than either of us could manage. Having company up Glen Licht was nice, particularly as I’d ridden with Bryan on and off since day 1. After Glenlicht House, the trail steepens to a push. I lead initially, but as soon as I stop to take a photo, Bryan pushes past and it’s the last I see of him before the finish. The push up is stunning. The Falls of Glomack are in dense shade, so no photos of that, but views back down the valley are captivating. In contrast to the pre-dawn push I had in 2013, I was again glad to experience this in the daylight. Bryan is long out of sight by the time I crest the summit of the pass. I linger a bit in the early morning sunshine. For too long really, as I know from previous experience, it took me 18 hours from Camban to the finish, and I hadn’t got to Camban yet. Still lost in my own little world, I see two horses ahead on the hill. The image seems to rattle around in head for a moment before coming back out again. Horses? Up here? 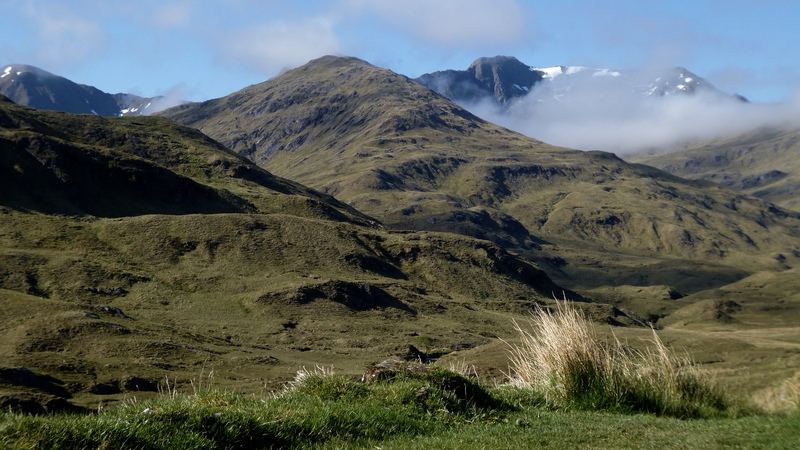 I ride on until we meet on the path; two women leading two horses over the pass and eventually to Knoydart. Like bikepacking, but with horses. Horsepacking, I guess. They’ve heard about the race, and think we’re all crazy. I get to Camban at 8:30 am and take a stop to look around, have breakfast and use the facilities (a spade). 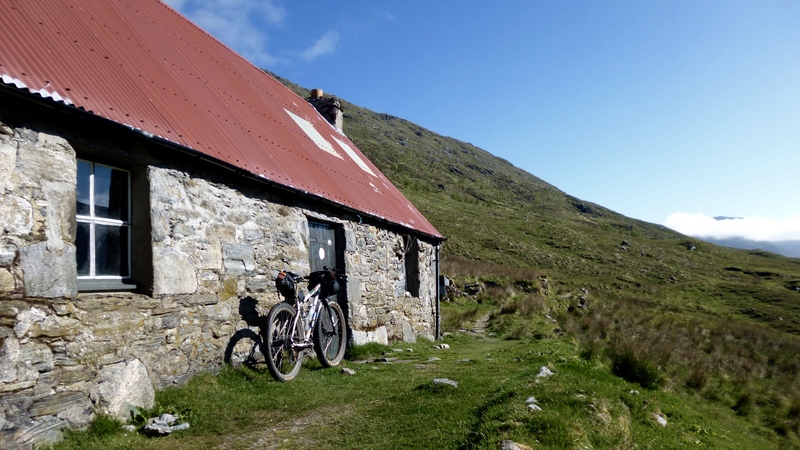 It’s nice bothy, and I must come back one day to stay over. It takes a while to make my way down the glen. Glen Affric is massive; it just goes on and on. The legs are turning but there’s little power coming from the engine room. Each little rise is slow work, bottom gear stuff. I resolve to ride everything, but it’s hard work. I cross the river at Althamulloch and climb up into the forest. 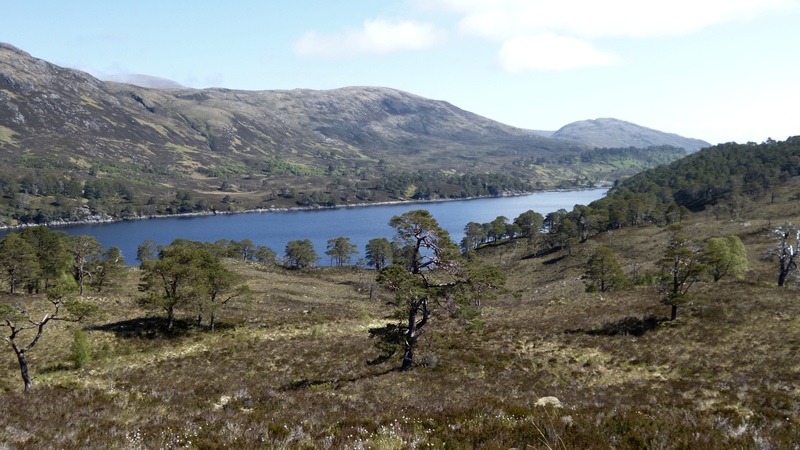 The scenery is wonderful, with spectacular views through the scattered pinewoods down onto Loch Affric. Things are hotting up now, and I welcome the shade on the last section to Tomich. All the way down the glen I had been trying decide when to stop for food. 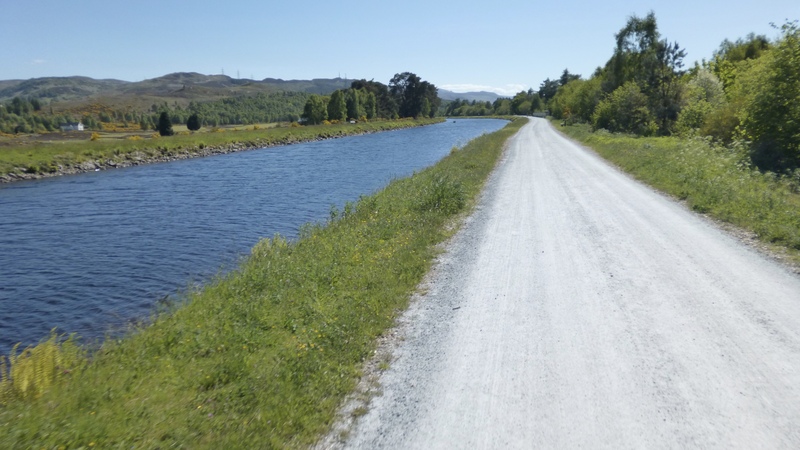 Initially I was hopeful of getting to Fort Augustus, but by the time I reach the turn at Tomich I coast straight down the road to the hotel. I’m the only one there; the proprietor seemingly surprised to have any custom at all. The lunch menu is basic, but that’s OK. Tuna mayo sandwiches seems to suit my palate. Within the minutes the plate was empty, and I curse to myself for not ordering two lots at the same time. I order a second lot, this time with cheese and pickle, and another coffee. I roll out of Tomich feeling 10 times better than when I went in. In fact, I’m like a different person. 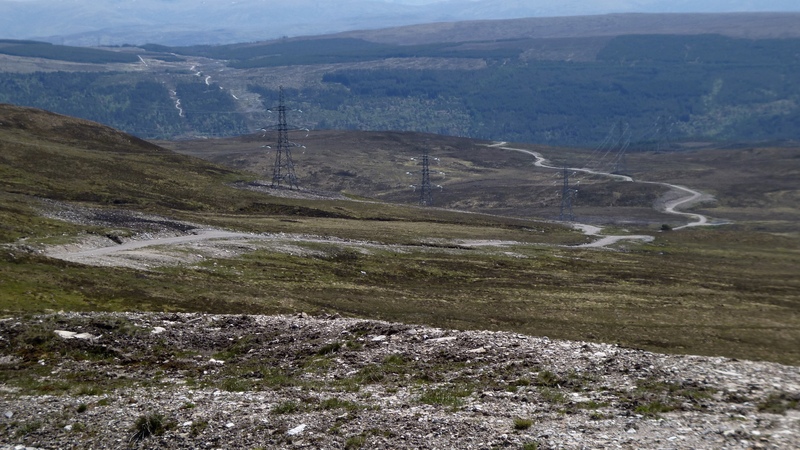 I set off up the track towards Plodda Falls, and take the turn for the power line track. There’s 400 metres of vertical height to be gained between here and Torgyle Bridge, but I seem to power over the top with ease. 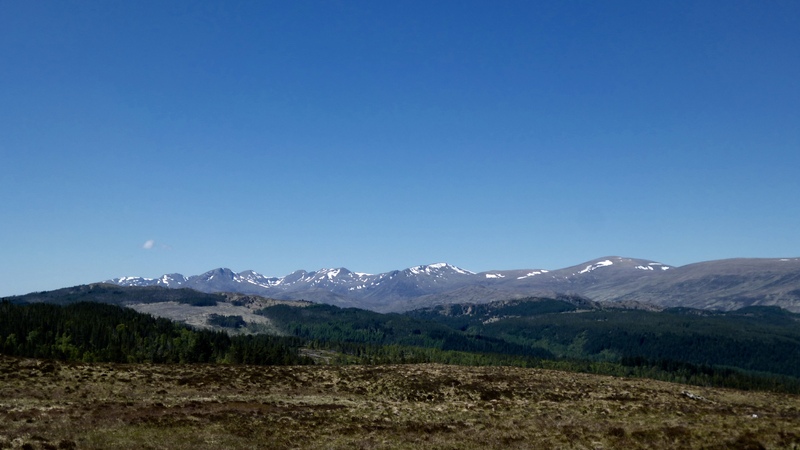 I cast a glance back towards Affric; this hill is like a transition between the wilderness of the north, and the beginnings of civilisation to the south. Despite feeling revived from two plates of sandwiches, it still takes 2.5 hours to reach Fort Augustus from Tomich. The final descent into town is painful, with the pressure on my toes returning again. I arrive at the infamous pizza house for the second time and quickly commandeer a picnic table and lay out my damp sleeping bag and bivvy bag in the afternoon sun. Via the side door, I catch the eye of the least grumpy waiter and order a pizza and two cans of coke, bypassing the lengthy queue at the other end of the restaurant. While I wait for the pizza, I sort through my kit arranging food for the Great Glen section and tending to my feet. I tape up my little toes to try to alleviate the discomfort. The pizza arrives and is soon consumed, all expect two pieces which I stash in my Lioness for later. I repack my gear, and all things considered, I managed to achieve quite a lot in the 40 minutes I was stopped for. The spin down the Great Glen was pleasant enough, but it is so mind-numbingly boring. I have a spell while my head nodded a bit, so I pulled up and put some music on – actually for the first time on the whole ride. Things got a bit more interesting once past Laggan Lochs, as you ride the forest road up through to Clunes, with magnificent views of Ben Nevis gradually coming into view. 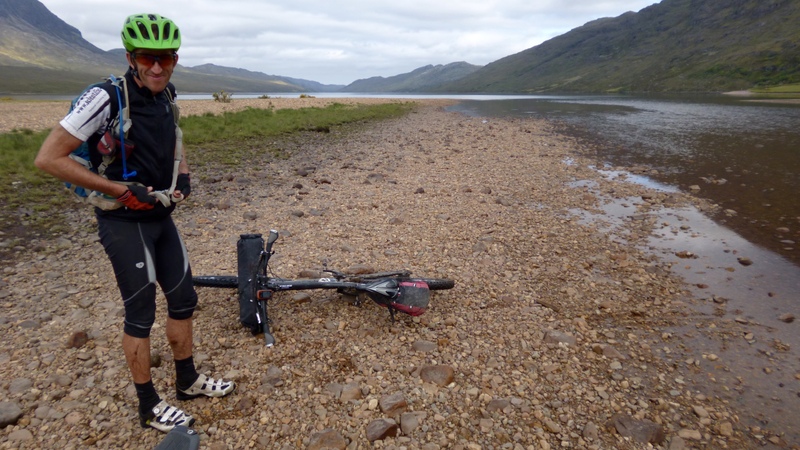 I reach Fort William at 6:30pm, which made it sub-three hours from Fort Augustus. I was happy with that. There was still 4 hours of light left, so I should be through Kinlochleven before it gets dark. 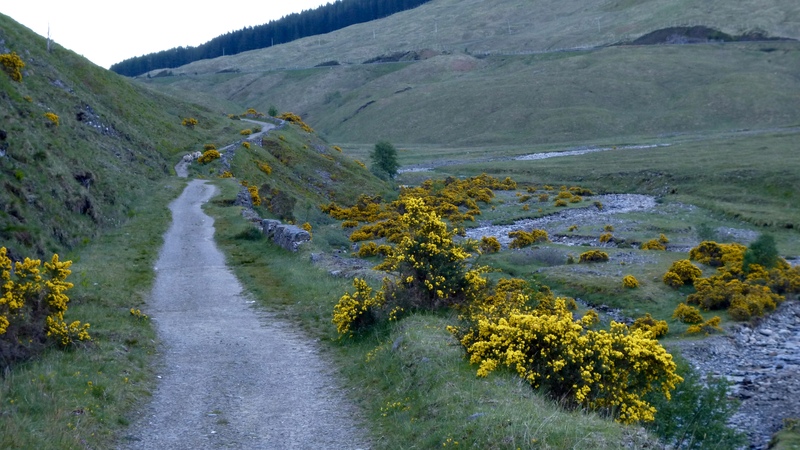 The climb out of Fort Bill through Nevis Forest is tough on tired legs, but I manage it all except the little pushes where the route appears to straight-line the sweeping forest road hairpins. After a little respite on a singletrack descent, I reach the wooden flight of steps. I cursed them, as I did in 2013, while dragging my bike up them awkwardly. I’d also concluded that the tape on my toes wasn’t helping as it was actually increasing pressure rather than alleviating it, so I took them off and rubbed some chamois creme into them. This was actually quite soothing, and I regret not thinking of it sooner. 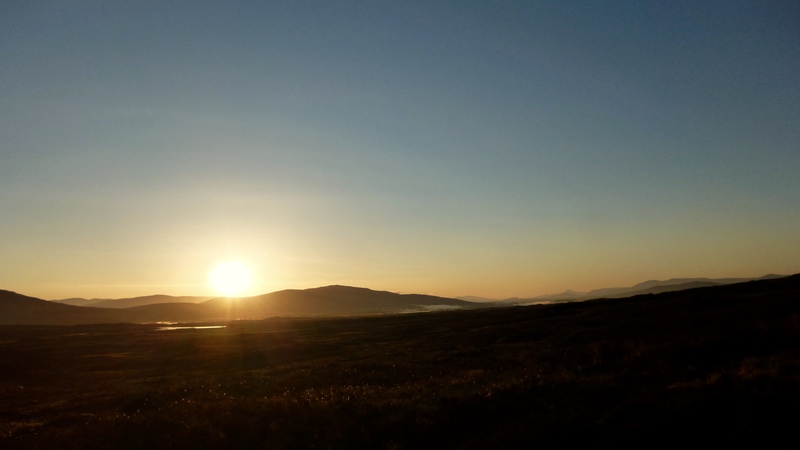 Out of the forest, the evening sun is beautiful, and as I make my way out of the valley on the old military road, it gradually fades from view behind The Mamore hills. The descent into Kinlochleven was painful on my feet. The downward gradient forced my toes into the front of the shoe, and however much I tried to drop my heel, it still hurt. Consequently, my technical ability failed to put in an appearance, and I bumped and clattered my way to the bottom. 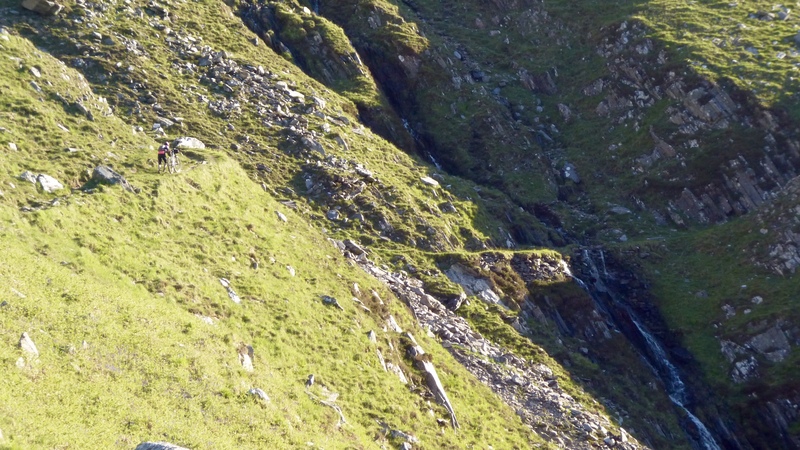 I wasn’t looking forward to the Devil’s Staircase descent, as I’d have to do that in the dark. Sitting outside the chippy in the rapidly cooling air, I assessed my position. I had a dilemma. I had the chance to finish in under 5 days, provided I got in before 9:00am in the morning. That’s only 11 hours away, and it was about a 5 hours ride. I wasn’t feeling confident about the technical descent of the Staircase in the dark, and did I even had 5 hours left in me? I decided to call Beth. She was prepared to meet me in the wee small hours if I chose to ride through. Then I thought about the kids. They’d seen me start, and Beth had told me they’d been little angels while she’d seen Lee, Javi and Ian finish earlier in the day. I really wanted them to see me finish too. To finish under the cover of darkness is a somewhat unglamorous way to complete the route. I decided I’d bivvy for one last time. 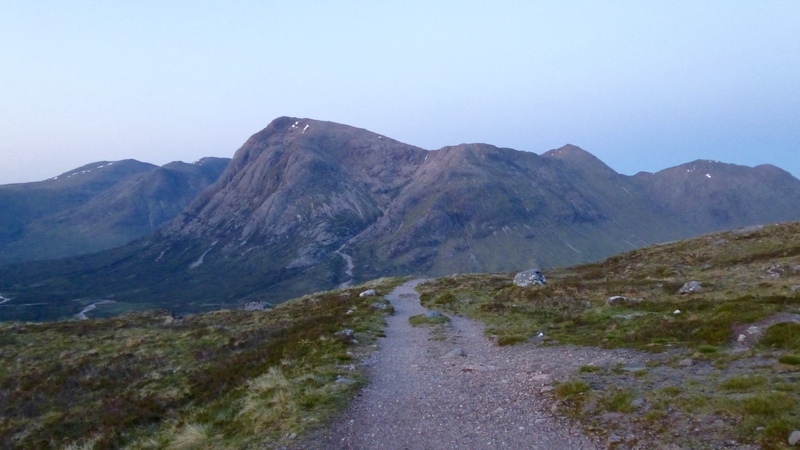 I began the climb up the Devil’s Staircase at 10:30 pm; the start of a long push, punctuated with bits of riding here and there, that would take an hour and a half. I arrived at a cairn at midnight. It was clear and cold. I set my alarm for 3:30am. At 2:30am, I heard the sound of feet on gravel and the ticking of a freewheel. It was Lars Henning. I’d passed him in Ullapool, and he’d been 10-20 miles behind ever since. For a fleeting second, I considered getting up to join him. I decided against it. The alarm went off at 3:30am. It was cold. I was cold, really cold. It was still clear, and the there was an orange glow to the north-east. There was also a layer of frost on my bivvy bag, which, given that my sleeping bag is only rated to 8 degrees Celsius, would explain why I was cold. I got up as quickly as I could, keeping my down vest on for the descent. As soon as I was rolling, I realised I’d made an error. I crested a small shoulder on the hill to reveal the real summit another kilometre up the trail. Damnit. I’d stopped at a cairn, but not the summit cairn. I looked anxiously at the time; 3:55am. I had 5 hours remaining. I should be OK, barring any disasters. One of the advantages of the cold bivvy was the swelling in my feet had gone down, so my toes didn’t hurt. Consequently, I made the Staircase descent without too much incident. 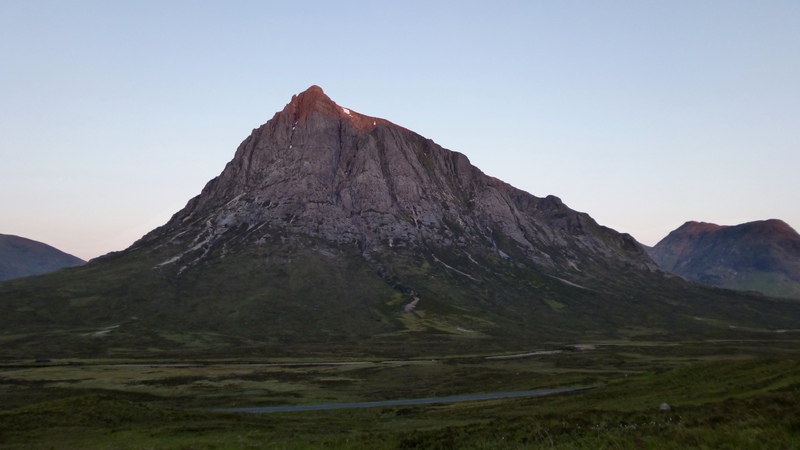 As I approached Kings House, the morning light was just starting to fall on the very summit of Stob Dearg. It was a magical moment, and I felt privileged to have been there to catch it. 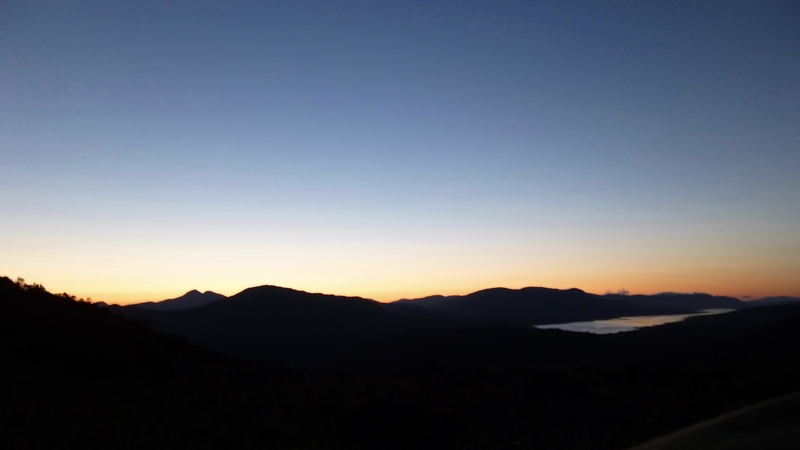 I crossed the A82 and as I embarked on the “ski station climb”, the sun broke over the horizon. It was simply stunning. Emotions were starting to build; I’d nearly done this and these were such amazing surroundings and in such amazing light to be doing it on, it was a really special moment. Though there was no warmth in the sun this early, it warmed my emotions hugely. I’m nearly done. Not far now. 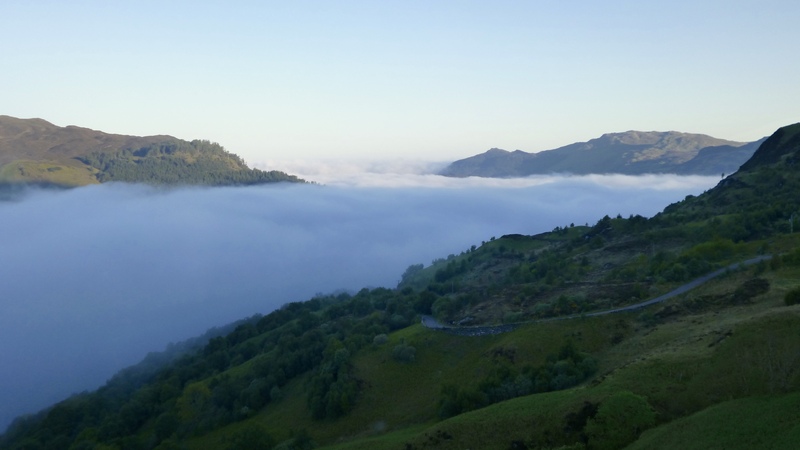 The rest of the climb passed easily and I continually marvelled at this place I was in – mentally and physically – that huge bubble that seems to separate you from the rest of the world, where it is just you, the bike and your connection to the surrounding landscape. 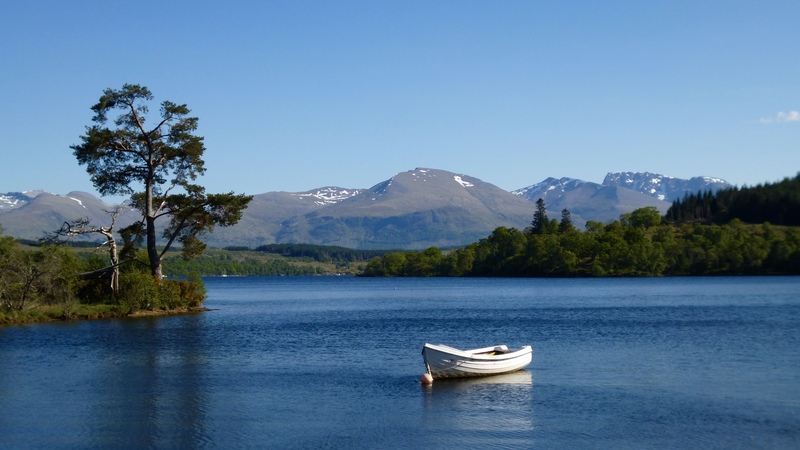 Loch Tulla, then over the A82 again at Bridge of Orchy and I was on the last stretch. It’s an hour from here. I took a bit of food at the railway station and discovered a can of Starbucks double espresso in my Lioness, that I’d bought in Fort Bill and promptly forgotten about. How they’ve managed to make cold milky coffee a saleable product, I don’t know, but it seemed to go down quite well under the circumstances. The last little bit of hike-a-bike under the railway brought me high enough up the hill to be back into the sunshine, and then, at last, it really was down hill to the finish. Beth was there, and the kids too, though they were hiding in the van to avoid the midges. I was glad to see them. It was a great way to finish; I was so glad I’d stopped for one last time, if nothing else to experience that fantastic sunrise. To share the finish with Beth was special too, even if I was a little dazed by the effects of the last 5 days. I crossed the line at 7:13 am. 4 Days, 22 hours and 13 minutes. After the trepidation at the start, with the feeling of being unprepared and the fear of another body-related failure, my initial emotion was relief. But relief is usually a temporary emotion, and after it came that inner glow and satisfaction that recognises a sense of achievement. I came to deal with unfinished business; to redress a past failure and to complete the Highland Trail fully so that I wouldn’t have to come back to do it again. But a strange and unexpected thing has happened. 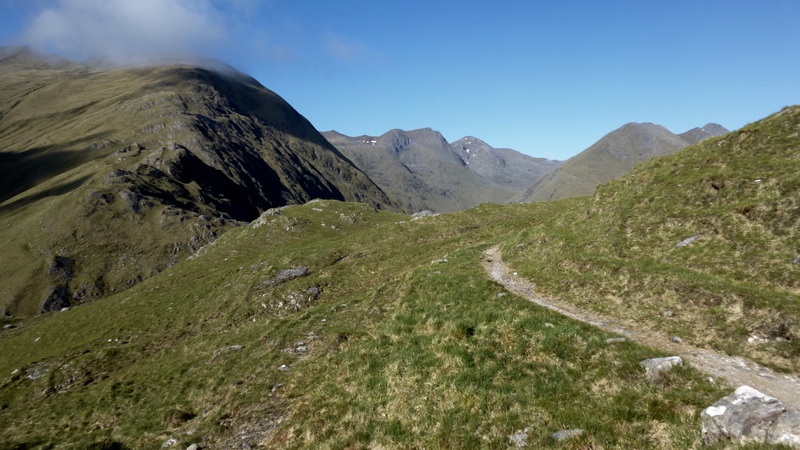 I found the Highland Trail hard, easily the hardest thing I’ve ever done, even in these perfect conditions. 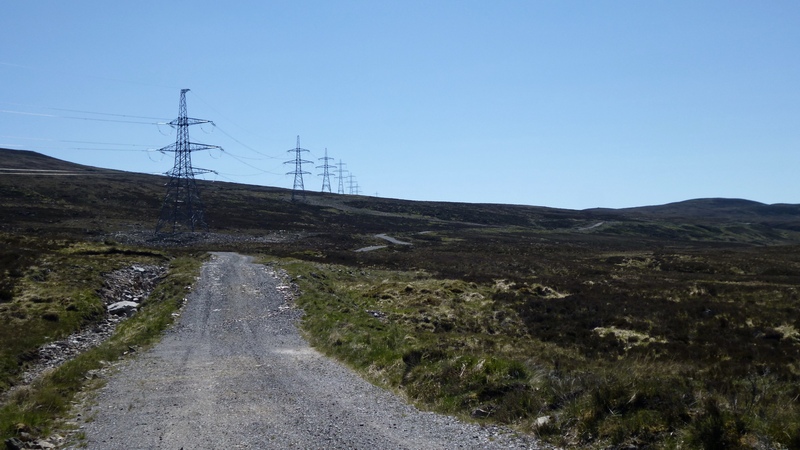 But to not want to come back at all would be a failure to recognise just what the Highland Trail is. 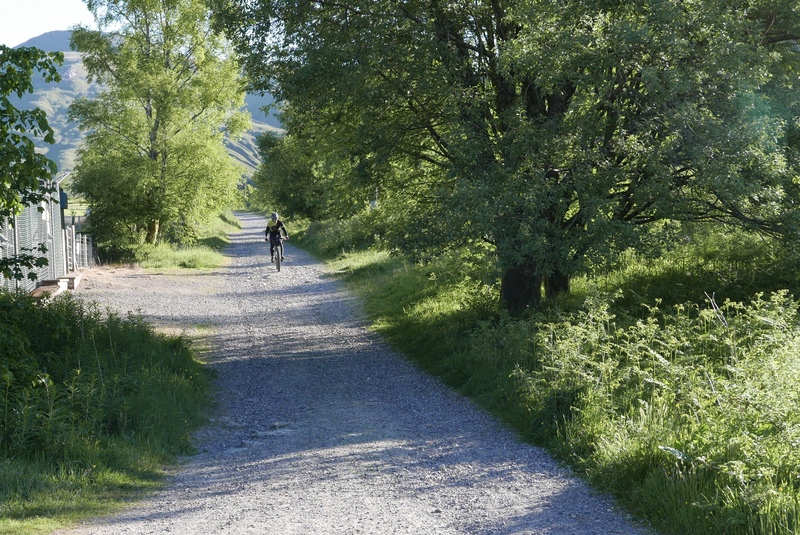 You see, it is more than a trail; it’s a route that takes you through some of the most stunning and remote parts of Britain that can be accessed by bike. So much of the route is simply magnificent. Mentally, it takes you to places that you don’t expect to go. You find new things about yourself, abilities you didn’t know you had and connections to places that will remain with you for ever. 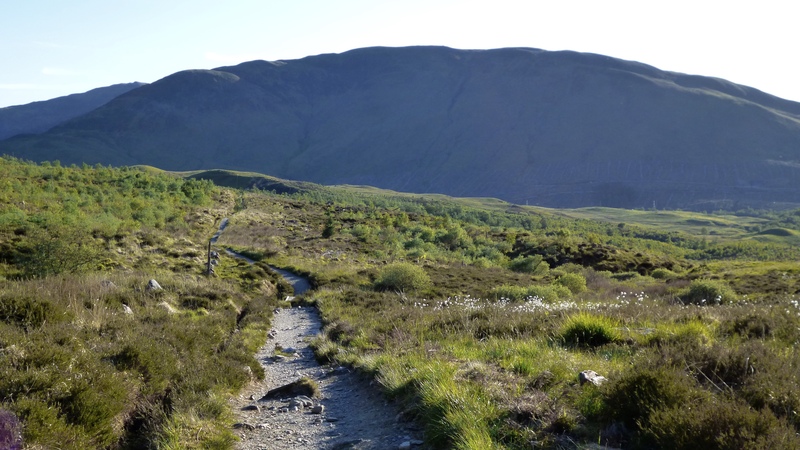 The Highland Trail is something that is so finely conceived, it is truly greater than the sum of its parts. Alan’s vision and execution is pure genius, and his creation presents a true and complete test of a person’s physical ability and mental resolve. And that is worth coming back for. Almost poetic Ian, and pictures get the spirit of it. Just read your epilogue and realise that’s why I seem to come back each year. It really is magical for body and soul. And thanks to Alan for putting it together. Thanks Eric. It took a couple of days to get the epilogue straight in my head, to accurately describe why I’d want to do it again. Great effort Ian and fantastic finish. Thank you for the absorbing wrote up and photos. Da iwan Ian. Great write up and photos. 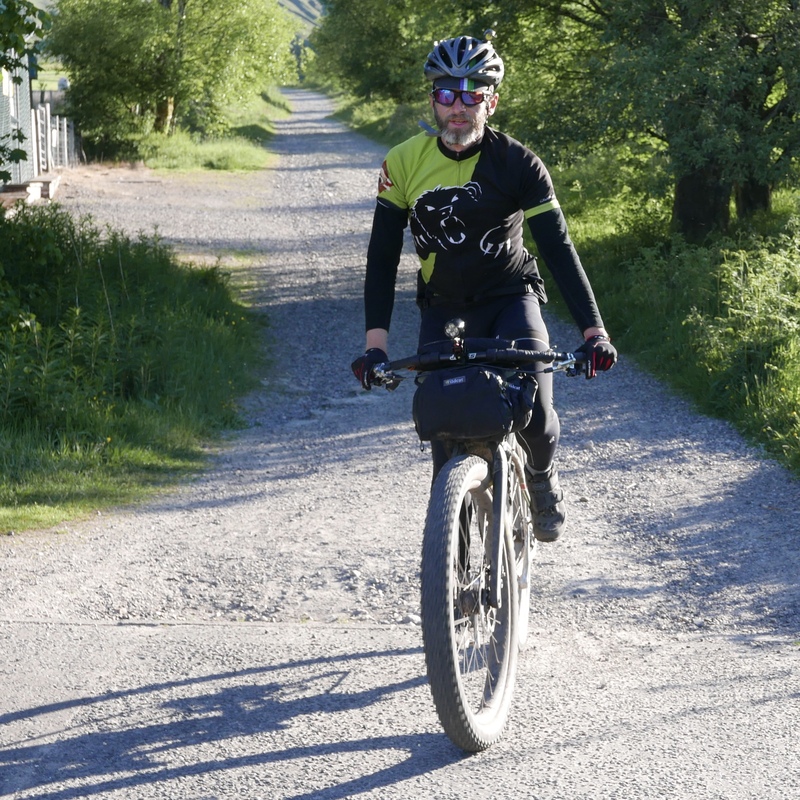 I rode a Genesis Longitude fully rigid on normal 2.4’s, full suspension next time…. An amazing achievement and fantastic write up, you won’t realise it but I bet you inspire quite a few people albeit for slightly less extreme trips! One question though… did I read that correctly, you’re entire sleeping kit in one 5L dry bag?